Afro-Funk-House artist Kagwe Mungai has teamed up with Afro-pop singer Dela and rapper Khaligraph Jones to produce a track in celebration of our local football heroes. Dubbed Hii Game Ni Yetu, the song captures the celebratory, upbeat spirit that is inherent to Africa, to motivate the SportPesa AllStars players and get supporters fired up ahead of the much-anticipated football friendly match between the SPL-select team and Hull City FC. The match which will take place take place on the 27th of February 2017, will see a Kenyan side play an English Premier League club for the first time in history. 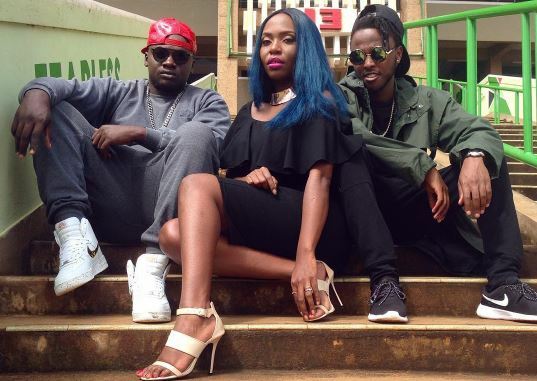 Dela, who took 20 minutes to write her part in the collabo, attributes the success of the track to great chemistry from the first meeting of the artists in the studio. “I love it when everyone is on the same page, it makes for a great collabo. The vibe was right because we understood that the SportPesa All Stars team was a huge opportunity for the players; life-changing even,” she said. Khaligraph agrees with Dela that the trio was a power team each being among the leading in their different categories, hence the ease with which they put the anthem together. Dela reckons that everyone should listen to the song, not just football fans because it’s bound to lift spirits and get the fans moving.